Edited: This photo has been removed for publication. 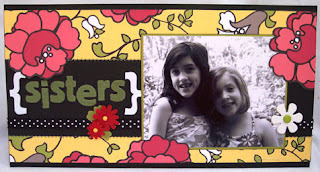 for Melissa Phillips' challenge over at her blog Lilybean's Paperie. For this card, I used a kraft envelope for the background paper, a die-cut from foof-a-la's Thrift Shop page kit, Hero Arts, alphabet stamps, some Heidi Swapp hearts (chipboard and acetate), a foof-a-la button, some American Crafts ribbon, and ColorBox ink. 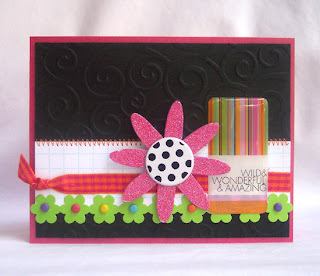 Thanks for the fun challenge, Melissa, and thanks for stopping by to take a peek! First is this Crate card. I love this Samantha line, such beautiful colors and patterns mixed together. I bought the Crate Mega kit over in the Scraps and Bits store at Self-Addressed. I am in Crate heaven! 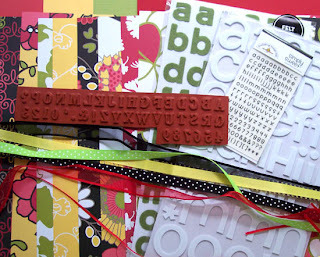 All the paper, ribbon, rub-ons, and chipboard from all 5 new lines. Do I really need that much? Well, sort of. 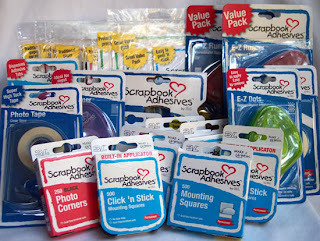 My mother-in-law asked me to do a scrapbook for her, and I thought these products would work well with her photos. How am I going to do a whole scrapbook? I'm not quite sure yet. But I am sure going to try. Next is a little Congrats card. It is a little more masculine than I tend to do, but I like the color combo and it seems to work, so it's a keeper. Lastly is a quick and easy monogram card. I used the die-cut tags from the Basic Grey Pheobe pack. I love these colors. So pretty and girly. two done. So thanks for stopping by! Edited: These three cards have been removed for publication. Oh well, I need to go clean up my scrap space. I think I pulled out half of what I own. 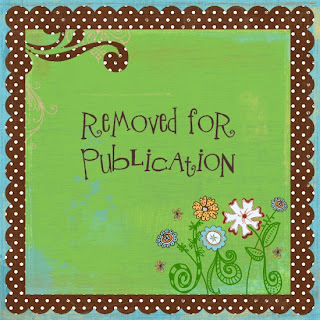 Edited: This card has been removed for publication. I do have a few projects to share today. Some of my June DT projects went up on the SA site, so I can show them off. I finally did a 6x12 layout. This was actually pretty fun, once I figured out what direction to go with it. Next is a card. I am just in love with these foam letters from American Crafts, especially this Rootbeer Float font. Well, that's all from me now. I need to get back to work on project I am right in the middle of. Thanks for coming by to look! for the DCM Embossing Dare. 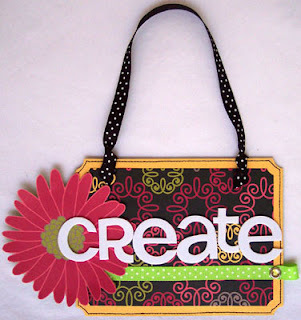 I used the Cuttlebug D'vine Swirl embossing folder for the background. Thanks for looking! Father's Day, so I got off my patootie last night and made a card for this special day. 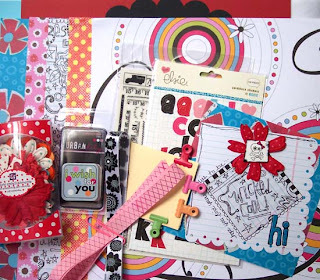 Most all of the supplies came from the June Paper Posies kit. It was just perfect for a Father's Day card. I also used Sketch #16 over at Sketch This: CARDS. I got a chance to play with my kits over the weekend. Some seriously fun stuff! I can't show my Self-Addressed projects yet, but I can show you a card I made with the fun kit Dani sent me from the CMK kit swap. 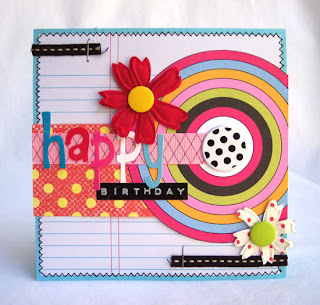 It's a little birthday card with a fun mix of papers and embellies. Dani sure knows how to put together a fab kit. I can't wait to play some more! I had two priority boxes on my doorstep today. Woohoo!!! I just love getting boxes. These boxes were chocked full of yummy goodness. One was my June kit from Self-Addressed. Can I just say I am in alphabet heaven! Not one, not two, not three, but four awesome alphabets. 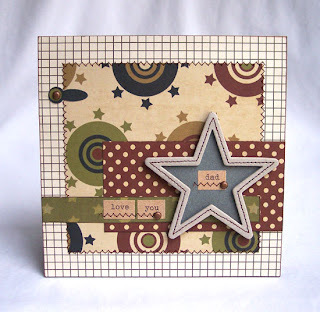 One of these is a stamp set by Purple Onion Designs. 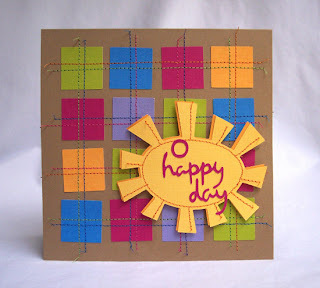 And I just love the bright colors of these American Crafts papers. I forgot to add the AC felt flowers and SA cards to the picture. I got a little too excited. ;) I can't wait to start working! My second box was full of yummy goodness too. 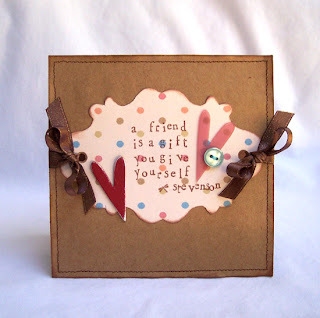 It was my Kit Swap kit from Dani at Create My Keepsake. There is so much fun stuff in there! Dani did a wonderful job picking out my kit. Everything she chose is new to me. I can't wait to start playing with these fun papers and embellishments. And just look at that awesome card she made for me. She ROCKS!!! Thanks for sharing in my happy mail day! It is still a work in progress, but go ahead and tell me what you think so far.